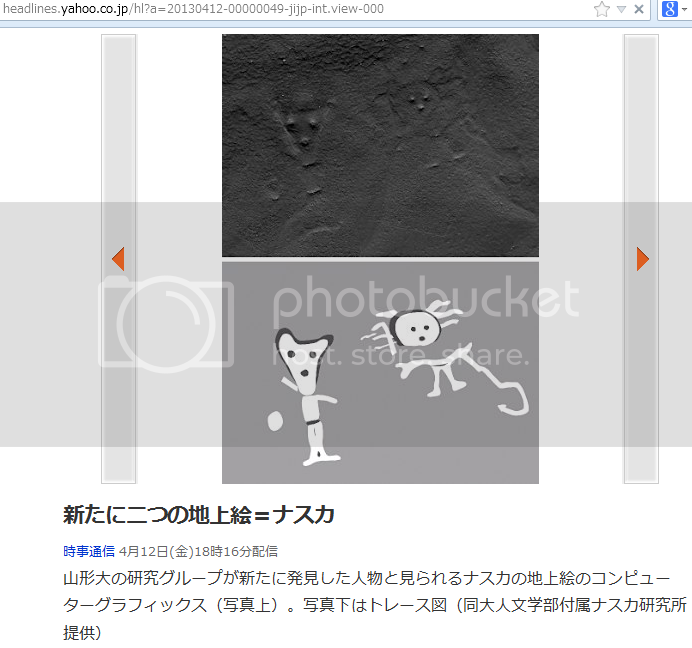 The article is a report about a new discovery of older glyph in Nazca plateau discovered by Japanese scholars. 2 humanoids side by side, one seem to be decapitating another. What amazed me personally was that the 2 characters were depicted so differently. What if the triangular headed person (who may be decapitating the head of another) or round headed person (decapitated head?) was an ET. The 12th, the research team of Prof. Sakai Masato of Anthropology Department at Yamagata University has announced by Peruvian Nazca plateau, known for "Nazca Lines" World Heritage Site, you have found a ground picture of two people lined up newly. I look person on the left is as off the neck of the person on the right side. Which combines and animals more than one person on the ground painting, depicting a scene of one the first time. Discovery place the center of the Nazca plateau. Head is inverted triangle, round head, left about 14 meters length, about 12 meters in height approximately 13 m length, about 7 m side, right. Remove the black stone in the plateau, contours are drawn in a manner piling up stones removed the eyes and mouth, but gap (gap) between the body and the head person on the right side. Is estimated to be that of 400-200 BC from geological survey, the research team discovered in the summer of '11, to report to the Peruvian Ministry of Culture. I announced in the U.S. archeology conference held in the U.S. Hawaii four days this month. I have considered the ground picture was painted for, such as ritual acts, such as praying for rain. 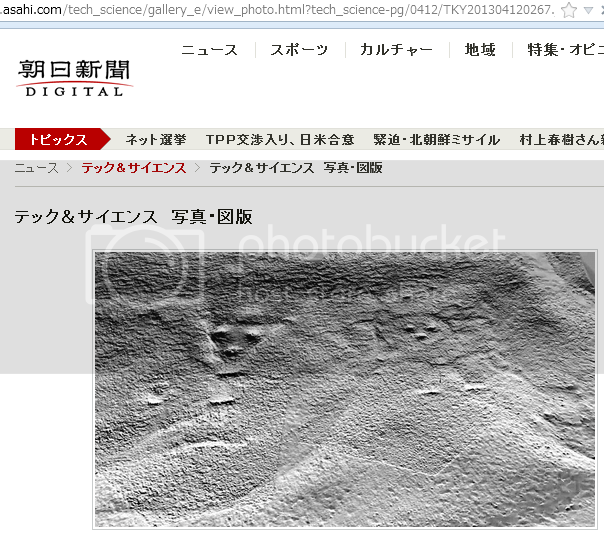 Sakai professor has discovered geoglyphs found the animal and a human head in January '11, and torso "The head is clearly separated, it seems to be beheaded, likely to mean a significant presence, such as God it is, "he said want to clarify or promoted the use of geological survey in the vicinity of. 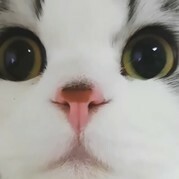 picture is also, or was drawn for what. [Maeda Yohei]"
Something is sticking out alright. But seriously, wth is that long protruding line with a curve at the end? Egyptian rod!?? Scientists have discovered the world's oldest collection of fossilised dinosaur embryos near the city of Lufeng, in Yunnan, China. The latest findings shed light on how dinosaur embryos grew and developed in their eggs. The 190-million-year-old dinosaur bonebed belongs to a group of dinosaurs called sauropodomorph Lufengosaurus - long-necked beasts that grew about eight metres long and lived during the Early Jurassic period in China. The circular stone structure rises to a height of 10 meters with a diameter of nearly 70 meters. "CNN) -- A mysterious, circular structure, with a diameter greater than the length of a Boeing 747 jet, has been discovered submerged about 30 feet (9 meters) underneath the Sea of Galilee in Israel. "We just bumped into it," recalls Shmuel Marco, a geophysicist from Tel Aviv University who worked on the project. "Usually the bottom of the lake is quite smooth. We were surprised to find a large mound. Initially we didn't realize the importance of this but we consulted with a couple of archaeologists, and they said it looked like an unusually large Bronze Age statue." The structure is comprised of basalt rocks, arranged in the shape of a cone. It measures 230 feet (70 meters) at the base of the structure, is 32 feet (10 meters) tall, and weighs an estimated 60,000 tons. It is twice the size of the ancient stone circle at Stonehenge in England." "The exact age of the structure has been difficult to pinpoint, but calculations based on the six to ten feet (two to three meters) of sand that have accumulated over the bottom of the base -- sand accumulates an average of one to four millimeters per year -- as well as comparisons to other structures in the region, put the estimate anywhere between 2,000 and 12,000 years old." The Temple of the Feathered Serpent, also known as the Temple of Quetzalcoatl, is a six-level pyramid decorated with snake-like creatures. "Hundreds of mysterious spheres lie beneath the Temple of the Feathered Serpent, an ancient six-level step pyramid just 30 miles from Mexico City. "They look like yellow spheres, but we do not know their meaning. It's an unprecedented discovery," said Jorge Zavala, an archaeologist at Mexico's National Anthropology and History Institute. The Mesoamerican ruins of Teotihuacan, a World Heritage Site, represent one of the largest urban centers of the ancient world. Thought to have been established around 100 B.C., the pyramid-filled city had more than 100,000 inhabitants at its peak, but was abandoned for mysterious reasons around 700 A.D. -- long before the Aztecs arrived in the 1300s." 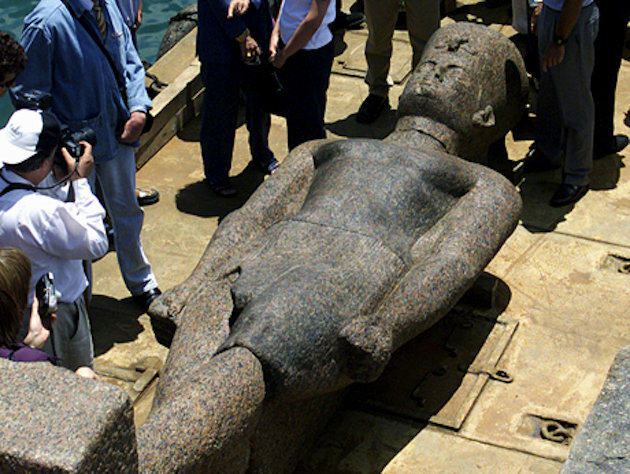 Until a decade ago, no one knew if Heracleion, believed to be an ancient harbor city, was fiction or real. Now, reports the Telegraph, the researchers who found it—150 feet beneath the surface of Egypt's Bay of Aboukir—are sharing some of the amazing historical artifacts preserved there. The finds include 64 ships, 16-foot-tall statues, 700 anchors and countless gold coins and smaller artifacts. why settle for 1 mother tongue? knowing who you are is different to knowing what you are? In ancient Greek religion and myth, Demeter is the goddess of the harvest, who presided over grains and the fertility of the earth. Her cult titles include Sito (Sitos: wheat) as the giver of food or corn/grain and Thesmophoros (thesmos: divine order, unwritten law) as a mark of the civilized existence of agricultural society. "The yellow spheres were uncovered when a remote-controlled robot carrying camera equipment was deployed to explore a series of winding and largely inaccessible chambers within the ancient pyramid ruins that are characterised by statues of strange serpent-like creatures. The walls of the tunnels are covered in a mineral powder made up of magnetite, pyrite and hematite." fake bs or the real deal? i hope the latter. "The team would not reveal the location of this incredible finding only saying that it is part of the Tayos Cave system. The explorers claim that they have concealed the location once again to make sure no one else locates the treasure until they get their samples tested. Once testing is complete, they agreed on the radio program to bring in a large professional team to fully excavate the site as long as they were part of it and were not robbed of their findings. " told all it was in the tayos cave system. I wouldn't jump to any conclusions just yet. They are real people and they come from a real university and they have designed a real robot with state-of-the-art 3D mapping cameras. Tlaloque 1 has been in the cave system for 3 years and provided images since. maybe the samples are for their stupid carbon dating methods which will get it totally wrong. if you found this library, would you try and keep the location a secret until something concrete can be secured for it in terms of security or would you just blab freely right off the bat? i'd prob keep quiet about it and play my cards close to my chest. having said that, saying they have found it (albeit not its exact location) would be alerting the treasure bandits to search extra hard around the tayos caves. evil private collectors will be sending their henchmen right now. My humblest apologies Slayer, can only blame it on the blonde hair and meds. Hope you found the robot stuff worthy of a read. "It’s not the legendary Atlantis, but researchers are claiming to have found traces of a long-lost continent buried in the Atlantic Ocean near Brazil. The researchers announced on Tuesday that samples of rock from the site appear to be remnants of Pangea, the prehistoric supercontinent from which the Americas, Africa, and other present-day land masses eventually emerged. 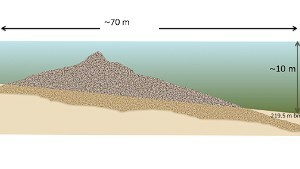 A Brazilian-Japanese team that included researchers from the Brazilian Geological Survey, the Oceanographic Institute of Sao Paolo, and Japan’s Agency for Marine-Earth Science and Technology found the rocks during an expedition to study the Rio Grande Elevation, a high-rising mass of ocean floor about 930 miles from the shore of Rio de Janeiro. Over a month of study, the team examined the formation up close through a series of dives in a three-person submersible craft to as far down as 21,000 feet below the surface. 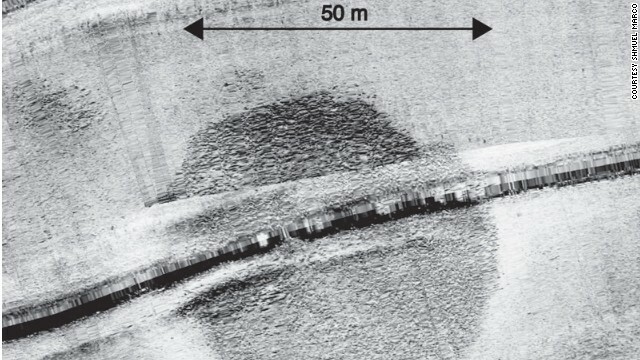 It was on these dives that the team noticed that the rock’s composite minerals included granite, iron, and cobalt, none of which were present in the surrounding seabed. The granite was a particularly noteworthy find, since this rock usually only appears on land." As far back as 4000 years ago we find evidence of mosaic patterns being used and the mosaic patterns and themes melded together. Recently, a spectacular colorful mosaic floor was discovered during recent archaeological dig near Kibbutz Beit Kama, in the Negev, southern Israel, according to IAA (Israel Antiquities Authority). 1,500-year-old mosaic is decorated with geometric patterns and its corners are enhanced with amphorae (jars used to transport wine), a pair of peacocks, and a pair of doves pecking at grapes on a tendril. The floor is believed to be part of a public building measuring 12 meters by 8.5 meters (about 40 feet by 26 feet) and its ceiling was apparently covered with roof tiles, but its precise role is still unknown. No images as yet, unfortunately. 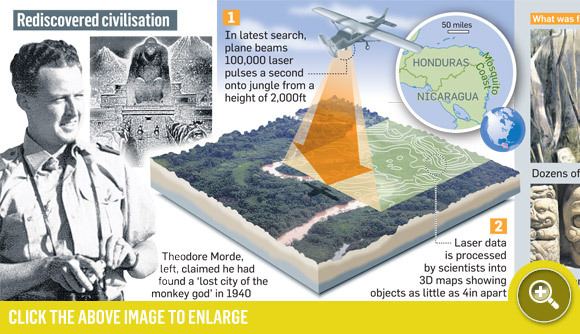 The Lost City of the Monkey God in Honduras is said to have dozens of pyramids, similar to those built by the Mayans. Archaeologists have discovered a lost civilisation deep in the jungles of Central America. The lost world resembles a "vast tended garden" and lies inland from the Mosquito Coast, an area known for swamps, poisonous plants and vipers that leap at their prey. this sounds like a great idea for a movie, i know we can call it KING KONG, oh wait hasnt this been done already ! Perhaps Planet of the Apes? Oops no that's been done too. How about Planet of the Naked Apes?